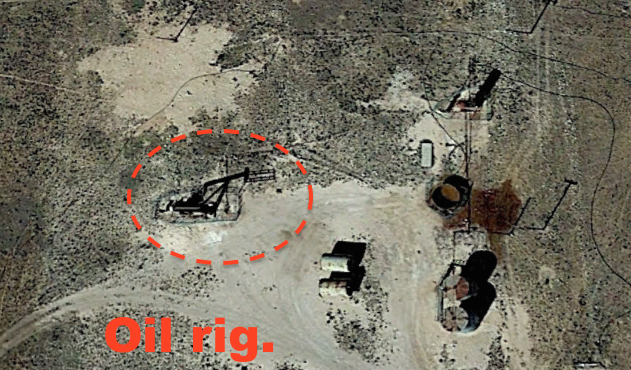 UFO SIGHTINGS DAILY: Aliens Warn Drillers Of Oil Field That Below Ground Is ET Base, April 2016, UFO Sighting News. Aliens Warn Drillers Of Oil Field That Below Ground Is ET Base, April 2016, UFO Sighting News. Religious Buddha Symbol Meaning Pure Goodness. Date of discovery: April 10, 2016, but is at least 50 years old. Lets start off with this, because its most important. This is not a symbol of Hitlers Nazis, but is the ancient buddha symbol that means pure goodness...thats thousands of years old. You see, the Nazi cross turns the other way...and thats why Hitler took the buddha symbol and flipped it backwards, so it would mean pure evil, but here in the photo above is the pure goodness buddha symbol. I think I visit enough temples in Taiwan to be able to tell. 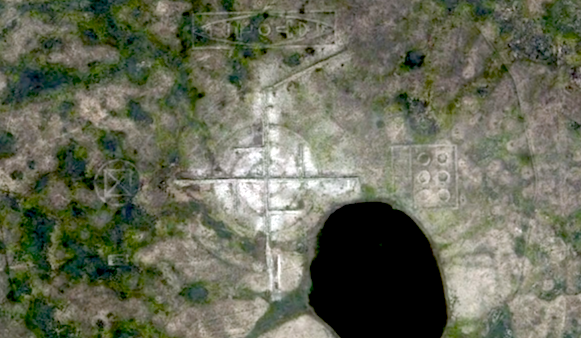 Also the writing in the rectangle above is alien symbols. 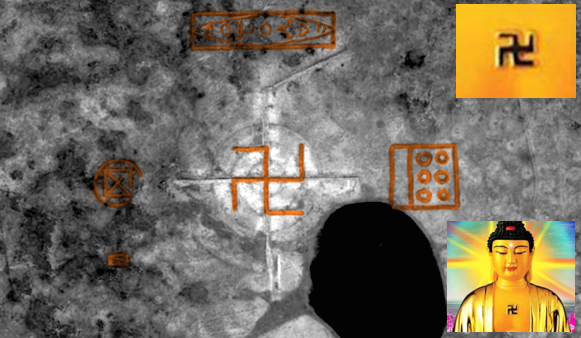 The symbols are very similar to those found at the Roswell UFO crash on small metal beams and parts. This formation is 600 meters by 491 meters across says Google ruler, if you don't count the circle thats all the way around it. This is far out there in an area called White Sands. This sign is 40 miles East of Roswell, NM the famous crash site of a UFO. 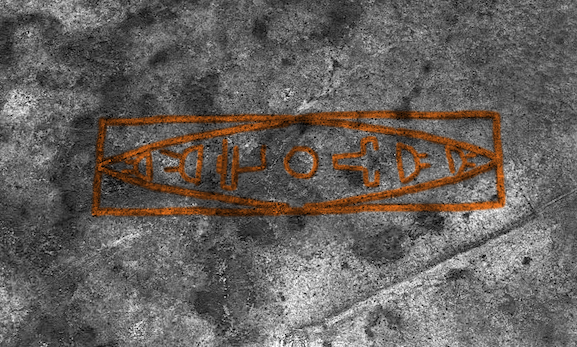 There are alien words in the rectangle above. Words that declare ownership of the area. 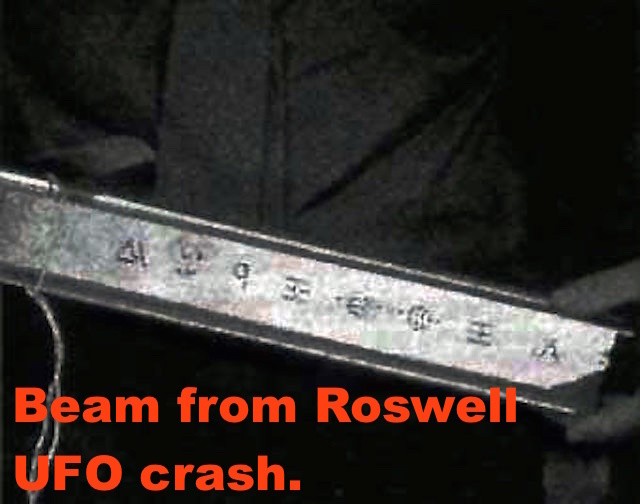 The same kind of writing found on fragments of the UFO that crashed at Roswell 40 miles away. So, you ask, why are aliens writing here in the middle of New Mexico? Its easy. This is a waring. There are thousands of oil rigs set up in this location. The closest one is just 40 meters away. Drilling down, deep into the ground, right through the ceiling of the oil and even below cutting through the floors of the oil lakes, causing it to spill down into the underground base. Yes, this symbol is there as a warning to humans...not to damage their base underground. The symbol of pure good at its center means that they don't want to pose a threat to us, only to share the land...below the ground.